Your Monday morning is overworked and you can’t stop running around. When you have time to breathe a little, you realize that you have a meeting in 5 minutes. Heck! You wanted to enjoy these few minutes to eat something. If your business is allowed to eat during a meeting, choose your snack carefully, as not all foods are necessarily acceptable. Surely you have already attended a meeting where you were bothered by someone eating crackers. It is not very pleasant. I have therefore prepared a list of healthy foods to enjoy at your next meeting. 1 – Smoothies: This is a great snack! In addition to being nutritious, the smoothie can be drunk with discretion. Here is a smoothie recipe to prepare at home before a big day of work. 2 – Cheese: Cheese will give you a satiety effect quickly and that benefits! You could even use your meetings as an excuse to taste a different cheese each time. 3- Muffins: The classic snack to eat in meetings. Most participants will eat muffins probably because it’s more “healthy”. Be aware that unless your muffins are homemade, they are unlikely to be less caloric than the donuts you look discreetly. Here is a delicious banana muffin recipe with low fat. To share at will! 4- Yogurt: A simple and effective snack that will fill your stomach. Ideally, drinking yogurt is easier to bring, however, there is less choice at the grocery store. The best choice is Greek yogurt for its many benefits. 5- Granola bar: An excellent healthy/sweet compromise. It does not give you an originality price, but the granola bar remains a winning choice to satisfy a craving during the day and save you from its last-minute meetings. Be careful with the commercial granola bars. Check their nutritional value and the amount of sugar. For future last-minute meetings, make your homemade healthy granola bars. 6- Houmous: Made of chickpeas, the hummus will quickly bring you satiety, because it is a good source of protein. With small pieces of pita, this will be a great snack. However, this food choice requires a lot of manipulation so it could distract you. Ideal for brainstorming meetings. 7- Popcorn: A homemade popcorn is low calorie and quickly satisfies the salty cravings. You can even sprinkle spices that you like. 8- Black chocolate: Eaten in moderation, dark chocolate containing a minimum of 70% cocoa is good for your health. It is a good source of magnesium, but especially an excellent anti-stress. 9- Fruits and Vegetables: Pre-cut for your meetings, fruits and vegetables are undoubtedly the most sensible choice for your health. Alternate the choice of fruit and vegetable each day to get a variety of nutrients and fiber. Pay attention! Some fruits/vegetables make a lot of noise such as carrots! 10- Dried fruits: A nice alternative to fresh fruit that will satisfy your “sugar bug”. Beware, however, not to abuse it, because it won’t be a healthy option. Voilà! 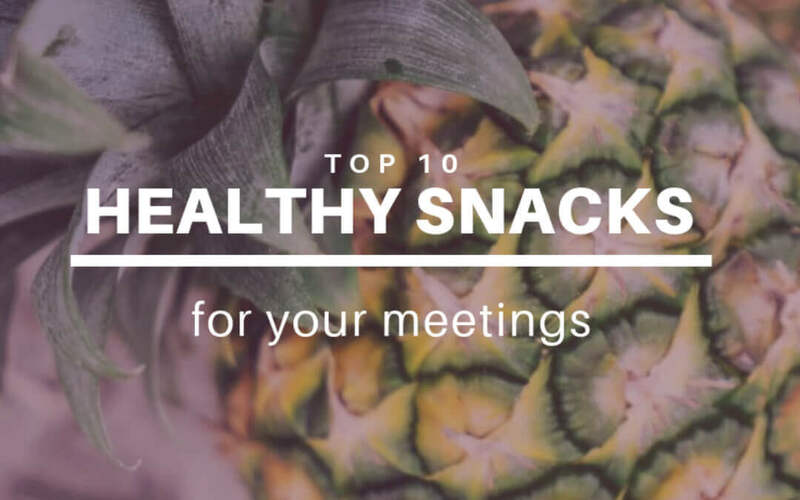 With these snacks, your concentration will be at the peak during meetings. Choosing snacks that don’t make noise is even more justified when an audio recording of the meeting is in progress.